Learn how to make extra fudgy one-bowl brownies with lots of chocolate chunks… That are only 76 calories! They’re so rich & don’t taste healthy at all! In 8th grade, my middle school’s concert bands planned a four-day field trip to Disneyland. Our band director scheduled a performance for us inside of the theme park, but for the remainder of our two days in Anaheim, we raced around Disneyland to fit in all of our favorite rides. For each of the eight-hour bus rides from our Northern California town and back, the chaperones packed plenty of VHS tapes to keep us occupied. Of course, knowing our destination… Most of those movies were Disney-themed, like Aladdin, The Little Mermaid, and The Lion King! During the last half hour of our Sunday drive, one chaperone popped in The Lion King 1 ½. Since my friends and I hadn’t seen it, we were bummed when the bus pulled into the middle school parking lot… So we decided to meet up at my house the next weekend to watch the rest! 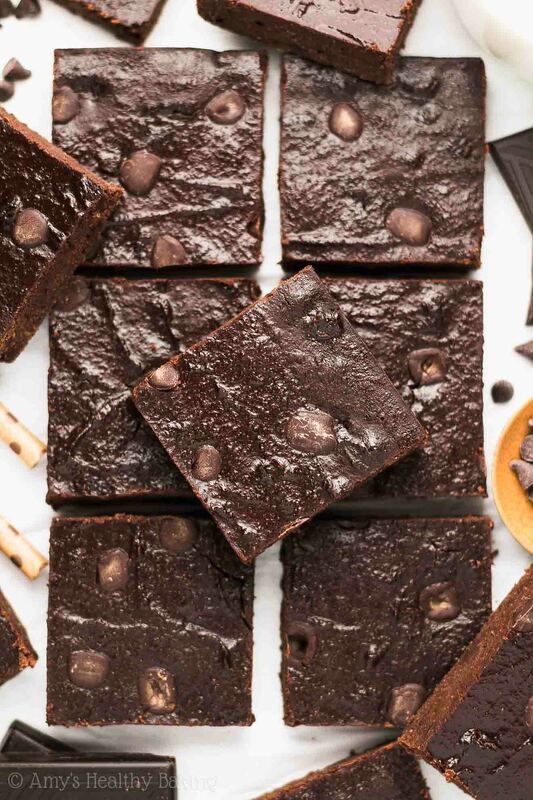 That afternoon, my mom picked up pizzas from our favorite restaurant, and I whipped up a batch of boxed mix brownies (each of my friends had a sweet tooth as big as mine!). Before settling into the family room and pressing play, we grabbed paper plates to serve ourselves lunch. Because I forgot to cut the pan of brownies, the first guy to reach them offered to help out. Mom handed him a knife, but… In his excitement over dessert, he sliced the most lopsided diagonal lines I’ve ever seen. Each brownie looked more like an uneven trapezoid or rhombus—not a single one was rectangular! Since then, every time I cut a batch of brownies, I think about that funky geometric pan… And feel very tempted to pull out a ruler, especially if I’m planning on photographing them to share with you! 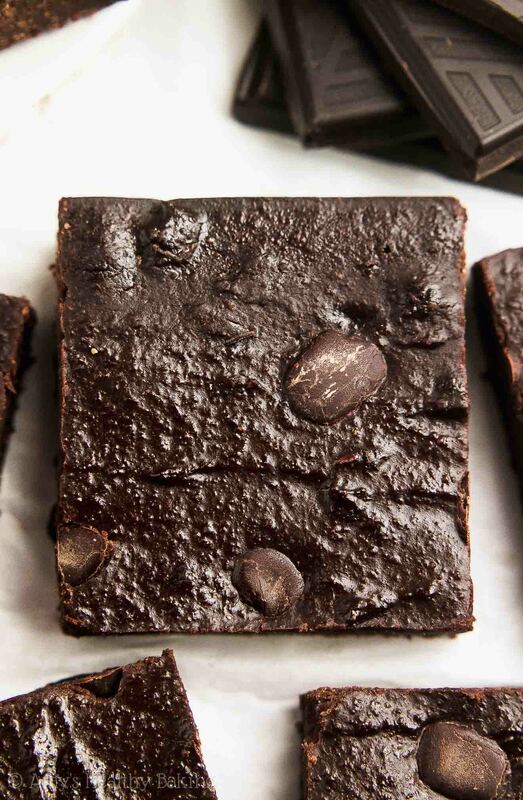 And yes, that happened with these Healthy One-Bowl Chocolate Chunk Brownies too! I think I did a decent enough job cutting them, don’t you? But regardless of how they look, they taste absolutely amazing! 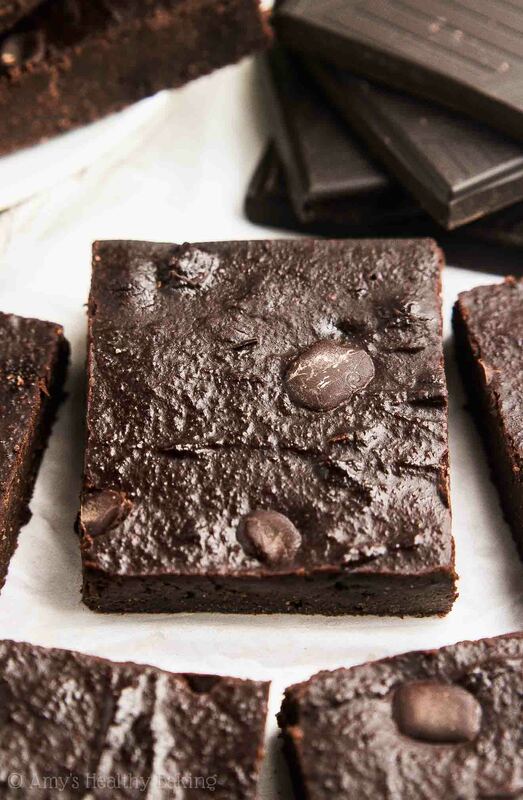 Rich, fudgy, decadent, chocolaty… Basically like squares of fudge with even more bits of chocolate sprinkled throughout. Even so, they’re just 76 calories! We’re using Greek yogurt! 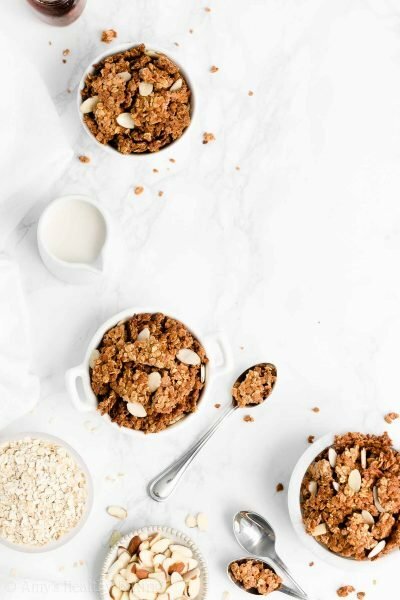 I love incorporating Greek yogurt into my healthy baking recipes because it adds the same moisture as extra butter or oil for a fraction of the calories, and it gives your treats a protein boost, too! You’ll sweeten these brownies with coconut sugar (like this!) rather than granulated sugar. Coconut sugar is an unrefined sweetener that comes from coconuts (probably pretty obvious! ), but it does NOT actually taste like coconuts. It has a nice caramel-like flavor similar to brown sugar, which adds to the richness of these brownies. Of course, the most important ingredient in this recipe is the cocoa powder! You aren’t using any melted chocolate (fewer dishes to wash—hooray! ), so cocoa powder provides all of that rich chocolate flavor in the batter. Remember to use regular unsweetened cocoa powder, like this! 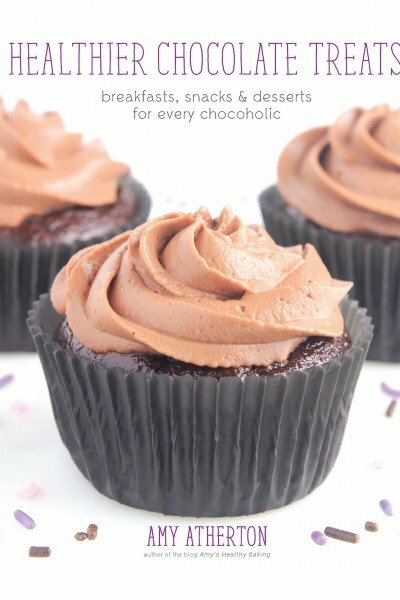 Do not substitute dutched or special dark cocoa powder. Those latter two have a milder and muted flavor, which makes the brownies taste bland, in my opinion. You’ll also mix in white whole wheat flour (like this!) once the cocoa powder is fully incorporated. No, it isn’t a combination of white (aka all-purpose) flour + whole wheat flour! White whole wheat flour is made by finely grinding a special type of soft white wheat (hence the name! ), whereas regular whole wheat flour comes from a heartier variety of red wheat. 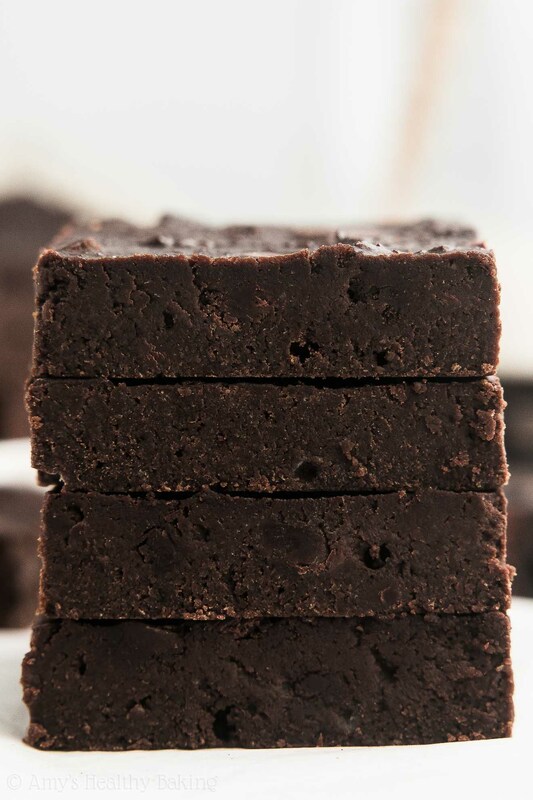 This gives white whole wheat flour a lighter taste and texture, which lets the richness and fudginess of these brownies truly shine! Just before spreading the batter into the pan, you’ll gently fold in chopped dark chocolate. I highly recommend these bars of Ghirardelli or Lindt! Aim to cut them about the same size as miniature chocolate chips. This ensures every bite has a bit of dark chocolate! Nerd alert! Bars of dark chocolate will actually melt in the oven, unlike chocolate chips, which contain a stabilizer that prevent them from fully melting. Nerd alert 2! You’ll bake your brownies at a lower temperature, only 300°F, to keep them supremely fudgy without the edges drying out. The brownies will be ready to come out of the oven when the edges look fully baked through but the center still looks glossy and underdone. The center will continue to cook through while your brownies cool on the counter. If the brownie edges pull away from the rim of the pan within 10 minutes of pulling them out of the oven, you baked them long enough! 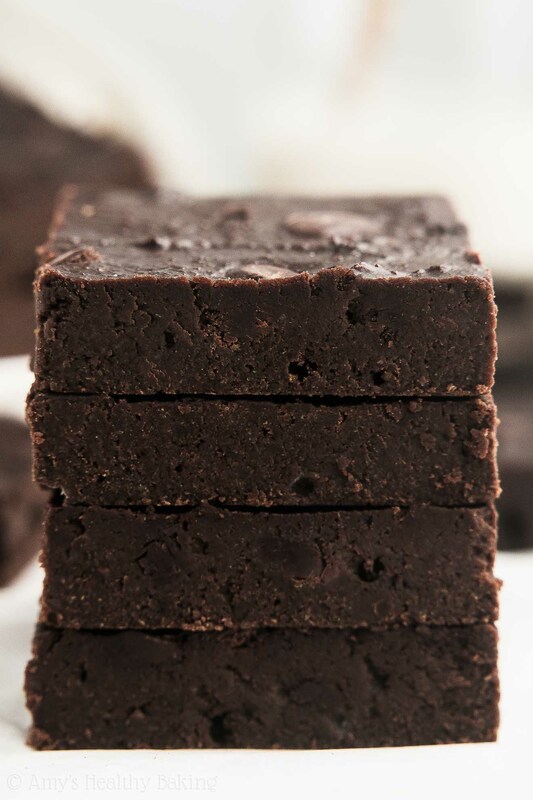 I know it feels almost impossible to wait for your brownies to rest for at least 8 hours once they’ve reached room temperature… But I promise that results in the fudgiest texture! If you cut into them sooner, they’ll have a slightly more cakey texture instead. And I’m definitely Team Fudgy when it comes to brownies! Pure chocolate heaven! And when you make your own, remember to snap a picture and share it on Instagram using #amyshealthybaking and tagging @amyshealthybaking IN the photo itself! (That guarantees I’ll see your picture! ?) I’d love to see your brownies! 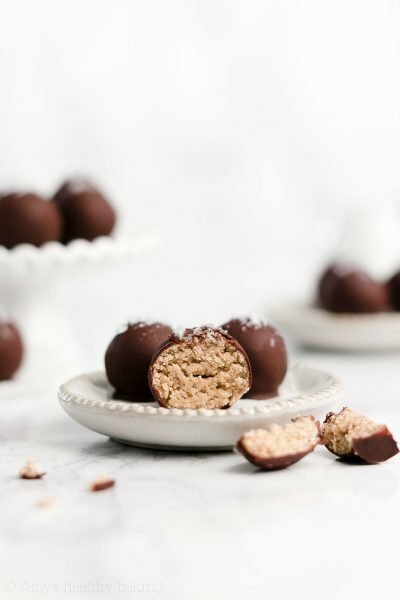 I’m obsessed with this recipe! 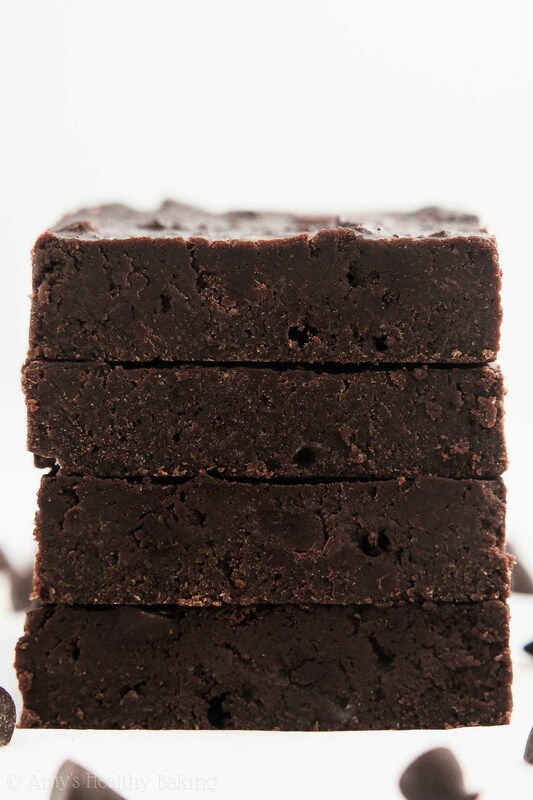 Brownies are my favorite dessert, and these are supremely rich, incredibly fudgy, and true chocolate heaven. They never last long in my kitchen! Leftovers will keep for at least one week if stored in an airtight container in the refrigerator, and they also freeze well. Preheat the oven to 300°F, and lightly coat an 8”-square baking pan with nonstick cooking spray. In a medium bowl, whisk together the butter, egg whites, vanilla, and salt. Stir in the Greek yogurt, mixing until no large lumps remain. Stir in the coconut sugar. Stir in the milk. Add in the cocoa powder and baking powder, stirring just until incorporated. Stir in the flour until just incorporated. Gently fold in 2 ½ tablespoons of the chopped dark chocolate. 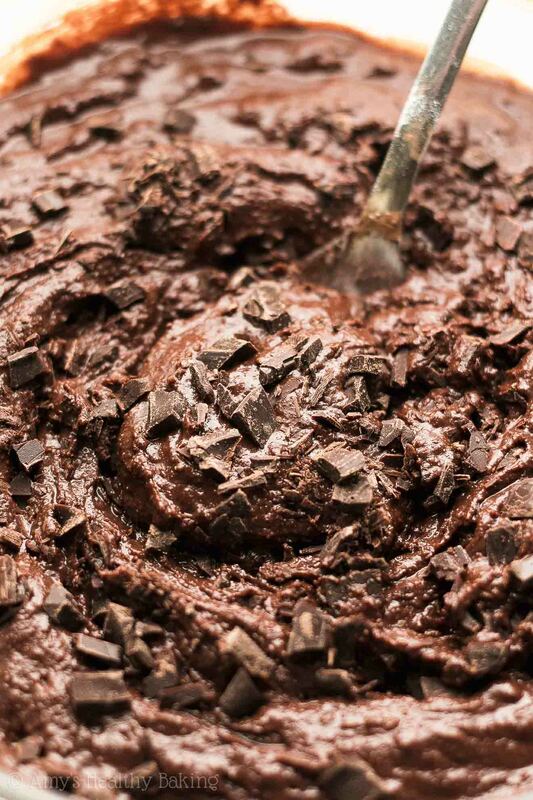 Spread the batter into the prepared pan, and gently press the remaining chopped dark chocolate into the top. Bake at 300°F for 15-19 minutes (15 minutes yields the fudgiest brownies; 19 minutes yields slightly cakier brownies). Cool completely to room temperature in the pan, and let the brownies sit for at least 6 hours at room temperature for the fudgiest texture before serving. Notes: Follow the instructions precisely for the best results! The order of addition and order of mixing together ingredients is very important. Do not use a stand or electric mixer! Use a whisk where instructed and a fork for everything else. For the gluten-free flour, use as follows: ½ cup (60g) millet flour, 2 tablespoons (15g) brown rice flour, 2 tablespoons (15g) tapioca flour, and ½ teaspoon xanthan gum. Most store-bought gluten-free flour blends (like this one!) will work as well, if measured like this. Regular whole wheat flour, whole wheat pastry flour, or all-purpose flour may be substituted for the white whole wheat flour. 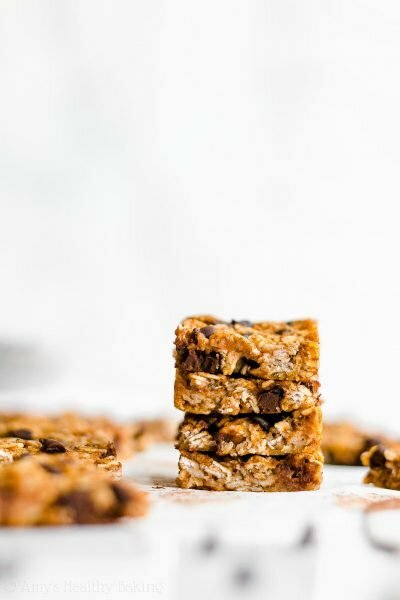 Oat flour (gluten-free, if necessary!) may be substituted as well, but be extremely careful when measuring it! I don’t recommend using Dutched or special dark cocoa powder. The brownies already taste very rich and dark chocolaty without it! Make sure you measure the cocoa powder correctly, using this method or a kitchen scale. (← That’s the one I own and love!) Too much will dry out your brownies and make them taste bitter. If your cocoa powder is very bumpy and/or clumpy, then sift it into the mixing bowl. Brown sugar or granulated sugar may be substituted for the coconut sugar, but the brownies will no longer be clean eating friendly. For the best results, use regular bars of dark chocolate—not chocolate chips! Chocolate chips contain stabilizers that prevent them from fully melting while baking. I love and highly recommend bars of Ghirardelli and Lindt! Cut them so the pieces are about the size of mini chocolate chips. 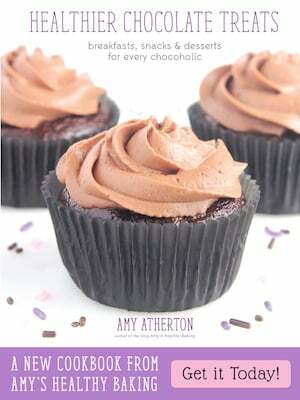 ♡ …and the rest of Amy’s healthy brownie recipes! Hello! Are there any non-dairy substitutions for greek yogurt? I could look for some non-dairy yogurt, but is there anything else that would work? Your recipes look delicious, but I see a lot of them require greek yogurt and I’m trying to avoid dairy! Thank you! I really appreciate your interest in my recipes Kristen! My brother is lactose intolerant, so I understand wanting to avoid dairy. If you’re able to find non-dairy yogurt (ie soy- or almond-based), that will always be the best substitute for my recipes. Other options will alter the taste and texture a lot more. 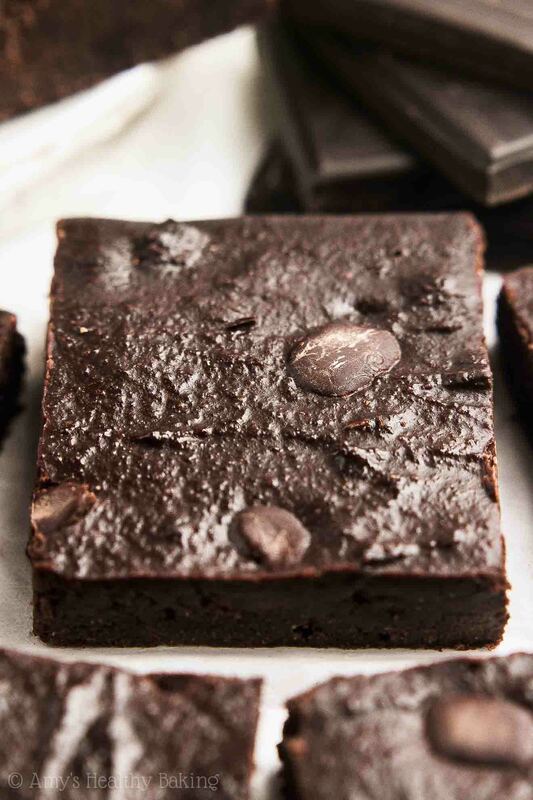 I’d love to hear what you think if you try these brownies! Thank you for introducing me to the world of baking with Greek yogurt! Such a healthy substitute for butter! I replaced the whole wheat flour with one cup of almond flour and they turned out so fudgy and moist. My husband polishes them off every time I make these brownies. Thanks Amy! I’m so glad you and your husband are enjoying these brownies Amrita! That means so much to me! 🙂 Thanks for taking the time to let me know! Hi Amy, I made it yesterday, waited 8 hours but the middle part seems uncooked while the edges are perfect! What could’ve gone wrong? Thank you. I found these excellent. I would like to follow your recipes as I think you are focused on healthy and absolutely delicious. I may need to cook them a little longer next time, but I just cut them in much smaller pieces and called it fudge!! I’m so glad you enjoyed these brownies Rosaria! Thanks for taking the time to let me know! 🙂 It means the world to me that you’d like to try more of my recipes — I’m really excited to hear what you pick to make next! I am not happy with this recipe. The brownie is flat and rubbery. Ingredients and method followed. I would rather cook a traditional brownie recipe. I really appreciate your interest in my recipe Alana! That sounds very disappointing and not like how these brownies should turn out at all. They should be moist and fudgy, not rubbery, so I’d love to work with you to figure out what happened in your batch! 🙂 Did you make any substitutions, including those listed in the Notes section? Did you use a stand or electric mixer to make the batter, by any chance? How did you measure the flour and cocoa powder, with a kitchen scale or measuring cups? If the latter, can you describe in detail how you measured? What can I use instead of coconut sugar? I really appreciate your interest in my recipe Lana! I’ve actually covered this in the Notes section (located directly underneath the Instructions). I know it can be easy to miss! 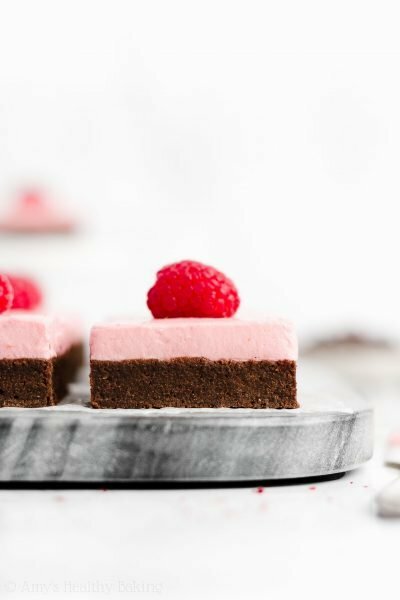 🙂 I’d love to hear what you think if you try these brownies! I made these and the batter was completely underbaked – not sure what went wrong. I used maple syrup instead of sugar. I really appreciate your interest in my recipe Ali! That sounds really disappointing and not like how these brownies are supposed to turn out, so I’d love to help you solve that issue. 🙂 How much maple syrup and how much milk did you use? Just made these and they turned out soo so well! I weighed each ingredient very precisely and followed the order of adding the ingredients and could not be happier with the outcome. One thing I will say; if you’re anything like me and your like to heavily taste test your brownie batter (in the name of science of course), you might want to bake them in a smaller pan as the batter did not go all the way to the edges. The recipe itself is perfect though and I will definitely make these again!